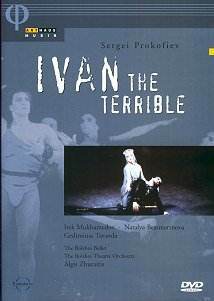 Ivan the Terrible, ballet in two acts. Rec. Bolshoi Theatre, 1990. DVD Region 0. I came to this release much more interested in the musical aspect of its contents, and indeed there is a reasonable amount of interest in that respect. However, let�s get one thing straight from the start: this is not a score solely from Prokofiev�s hand, as the cover might lead you to believe. Some have termed Mikhail Chulaki�s involvement as that of a musical arranger, but it is actually far more extensive. True, he arranged and adapted Prokofiev�s work, but he also added much material of his own composition in the process; hence I have chosen to list him equally with Prokofiev in the heading above. Prokofiev�s involvement with the Ivan project relates to the film by Sergei Eisenstein. The director had been commissioned by Stalin to immortalise his view of Ivan IV, whom he held as a personal role model, by inference legitimising Stalin and his actions. Chulaki�s role was to gather from Prokofiev enough material from which a ballet might be made. This explains to a large extent the posthumous work created here. There was in fact an oratorio version arranged by Abram Stasevich in 1962. Prokofiev himself expressed interest in the idea of a ballet but never acted on it. All in all Chulaki uses some 377 fragments of the score from Eisenstein�s film together with other Prokofiev works as his building blocks. "Thinking of Ivan" corresponds to the sixth movement of the Ivan cantata, "Ivan�s fortune" (start of Act II) with the Andante of the Third Symphony and "Kurbsky�s Escape" to the Russian Overture, op. 72. Add to this the obvious changes that Chulaki makes and you begin to hear what a sound soup this is, particularly if you know your Prokofiev. However, those that don�t are not likely to be so worried by such a tangled web of sources. The orchestra, though sounding a little thin in the top strings, acquit themselves well. The decent though hardly demonstration quality recording favours the lower registers and Zhuraitis conducts straightforwardly. The audience is, for the most part, unobtrusive. The dance aspect provides a unifying factor and it is a mark of its success that the stage action pulls ones attention away from the purely musical. Choreographer Yuri Grigorovich conceived the outline for the work with Chulaki, so was well placed to direct things with a sense of pacing and contrast that relates well in dancing terms. This, I assume, is what Simon Virsaladze has based his choreography on for the present production. Of the three principals Turanda�s Prince Kurbsky is to my mind the most expressive ("Kurbsky�s despair"), though Bessmertnova�s Anastasia (a role she created) is also affecting because of its inward and reflective portrayal. In many ways that gives the key to the work as a whole, concerned as it is with the emotions and psychology of the characters and Ivan�s development into the person he became. This Mukhamedov�s portrayal captures, with signs of the later Ivan noticeable from the start. By the end of Act I Ivan�s character is fully formed. The presentation has depth and intelligence, with booklet notes covering the Eisenstein film, Stalin, the making of the ballet score, dramatic structure and symbolism in the work, together with brief notes on the dancers. This much is bound to enhance the viewing experience and place it in a variety of contexts. The video direction favours whole stage shots rather than close-ups, which might have been used more often. On the whole though the atmosphere in which the action takes place is well conveyed. For lovers of ballet this will no doubt be of interest. However for those whose passion is Prokofiev�s music in its pure form this is a work to approach with caution.